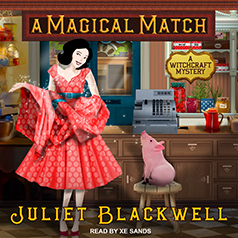 Witch and vintage store owner Lily Ivory faces her most difficult mystery to date with a case of mistaken identity that hits close to home. Lily Ivory and her friends are planning a 1950s-themed brunch to benefit the local women's shelter. When a figure from her past shows up unannounced, threatening her unless she returns something that belonged to him, Lily's fiancé, Sailor, steps in to defend her. After the same man is found dead later that day, Sailor is the primary suspect. He swears he's innocent, but multiple witnesses ID him as the perpetrator of the assault. Lily vows to clear his name . . . only she's not sure where to start with the mounting evidence against him.